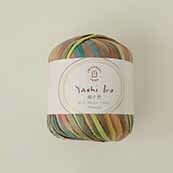 Yashi is the Japanese word for palm tree where this raffia fiber comes from. Yashi Iro is the variegated version of Yashi. Knit or crochet, raffia is interesting and fun to work with. From hand bags, hats, and home décor, you'll enjoy this unique yarn and the items you create with it. Hand wash in cold and dry flat, if needed. See Yashi solid colors here. This yarn is eligible for quantity discounts! Discounts are based on the total value of the order. Non-yarn items (tools, books, DVDs, etc.) can contribute to the total but do not themselves receive a discount.